A lady had hit a milkman by her car, a Hyundai Santro (I remember, a friend once remarked, women in car are dangerous, women in Santro are even more dangerous). The argument ensued and the poor man asked for a compensation of the milk which went down on the street, around four liter of it, approximately two hundred rupees in monetary terms, equal to two happy meals from McDonalds. The lady immediately, shunned all the pretense of being a lady, and was at the crudest threatening the man about and daring him to do whatever he can possibly do. Through all the arrogance, she adroitly nudged her way across the crowd that assembled, mumbling about her unjust arrogance, tamed and suitably impressed by her sunglasses and dress which spoke of the class (nothing in her behavior did, however), and then sped off. It suddenly brought to my mind two unrelated events spaced by couple of months. One happened at a Mall in Gurgaon, in the times when weather was forgiving enough for my daughter to enjoy trips in Metro which she sincerely cherished (still does, but the weather is no longer so forgiving). As we emerged out of the Metro, imaging the cooling effect on the general sentiment of people in Delhi and adjoining area and went on to have some coconut water, a couple joined in. The guy was thickly set, sign of person enjoying good things in life (read, beer), with the girl, slim and dressed in high class western clothes, with I believe, some great unpronounceable brand tagged on to them, with big, fashionable sunglasses. I picked my glass of coconut water, the boy took his, the girl picked a glass from the counter, took some deep sips and placed it back on the counter. The guy running the stall, billed them for two glasses, and all hell broke loose. The man was called dumb, stupid and what not, as the rich people walked off, saving forty rupees off the glass of coconut water. I was amazed and surprised. I remember when we were students with the usual arrogance of youth, backed by near immunity in the Hostel of engineering college and strength of numbers; there used to be numerous scuffles, almost once a month. But even if people might call it goondaism or whatever, it was almost eight times out of ten with some known bad element in the vicinity, not with poor, street vendor. Another incident, was a few weeks back as we were having some dinner at a restaurant, a group of three youngsters took the table next to us. It was an usual group with a girl and two guys ( I do not know what is with mixed groups these days, it is so rare to find an all girls or all boys group). They ordered something and had some expectation for it. Only catch was that the restaurant had different idea of what was to be served against that menu item. So not knowing the secret desires of the young patrons, the hapless guy served what they always served. They called the guy who took the order and told what they had expected and the guy, old enough to have kids of that age, told them that against that menu item this is what is always served. The girl stood up, at the top of her voice called names to the poor attendant. The owner of the restaurant intervened and told them to order whatever they wished to, without any charge and the poor attendant was asked to stay away from that table. I could not but feel anger and annoyance at the giggles at the next table post the event when men (I should rather say boys, who will never be men, alas) appreciated how the girl scared the old man. Nietzsche said when Men will become like women, no wonder, women will rule; and I do not suppose with rule he meant about J. Jayalalita or Mamata Bannerjee who recently won election, which is a just cause and a just rule. 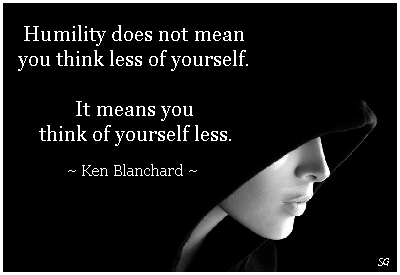 Arrogance is the new norm, humility is considered to be looked upon with suspicion. The man is arrogant, that is normal, but why is somebody polite and humble, he must be wanting something. We lost the touch with our kinder self and have created a world in which we are all the time fighting. Anyone who thought of arrogance as a sign of self-confidence is mistaken. People, particularly, marketing people, who want to fool the young people into buying their stuff, and help them getting richer, calls this phenomenon of dumbing down, and arrogance with positive connotation of brave, young world. I am not sure that they are stupid enough to not know that this arrogance is actually a sign of lack of self confidence. The man who is most ready to strike is the one who is most scared. When a two year old child leaps at you, you do not hit back, because you are aware of your own place on the general scheme of things, you are aware of your strength to hold back against any danger that might emerge out of the child leaping at you. Lack of confidence scares you, you are not sure of your own place in the world and therefore, you want to hit before there is any possibility of your esteem and position going down, in the event of other party hitting out first. You feel your size and stature is going to be defined by those around you, and you lack yourself so much that you are prompted to hit first. Another reason could be the limited sense of logic. The guy in the restaurant could have simply asked for the dish in the way he wanted, even after paying for the unintended one (not more than fifty rupees, half the price of Happy Meals). Why I refer to Happy Meals, is because all the protagonists come from a class which provides that much to their kids a daily allowance, and this puts the matter into perspective. My daughter who will be celebrating her third birthday tomorrow and with her I celebrate my third birthday tomorrow (was I really alive, when she was not there? ), asks amused, why the lady (or should I say woman, not to use the term lightly) acted that way to the milkman. I tell her, what the woman is doing is wrong, and since poor man has lost something, one should apologize and if possible, pay up. I tell her, and hope she will remember and continue to believe what her father tells her even when she grows up in a hostile and dumb world around her. I hope, I can teach her that arrogance is the sign of lack of self esteem, and I hope I can teach her to appreciate what a wonderful human being she is, who does not need anybody’s affirmation to know and understand her value. I hope, she grows up to understand her true value, which stands firm in the face of adversity, and will be able to pick the right kinds of fight to keep the fire of youth burning, without any self-doubt. I look at her and am totally drowned in the innocence which I see in her, with which she awaits her birthday. I look deep into her eyes and think, does she know, what she has done by coming in to my life? Every child is a great human being, and then life corrupts him. If only the child could understand its own worth and protect it and guard it, before it gets mellowed by the arrogance and littleness of those around her. As parent, it is my job to help her appreciate her own value, which is there, and which is intrinsic and which is not to be impacted by anything that happens in the world around. If a tree were to fall in a Jungle and make a noise falling with no one to hear it, would it still have made a sound, If you believe yes, so is true the sense of your own value. It is only this inward understanding of self-worth and inner struggle to extend and enhance it, which will bring the arrogance down, and will make every man and woman, man enough to stand the arrogance around us, without getting impacted by it. It is this understanding which I offer you my child, on your third birthday and this is what I will keep on offering you, till the time, you have time to hear out to me, so you would not become another of those, arrogant Indians (argumentative is Ok, it is rather good for your intelligence).